My husband is doing yardwork today, which means he has the garage all disarranged with bikes and mowers and all kind of things in the normal walkways. I am in the office and hear my husband’s voice yelling, which tells me that he is trying to convey some kind of information to my mother. Upon investigation, I find that she wants to get the laundry basket from the garage in order to gather up her dirty laundry, and even with all the clutter in the way, doesn’t quite understand why she can’t just get the basket and get her laundry going. After a few minutes, I remember that she has her own laundry basket, purchased specifically for her, as the latest in a series of attempts to keep my Clean Laundry basket used for only clean laundry. 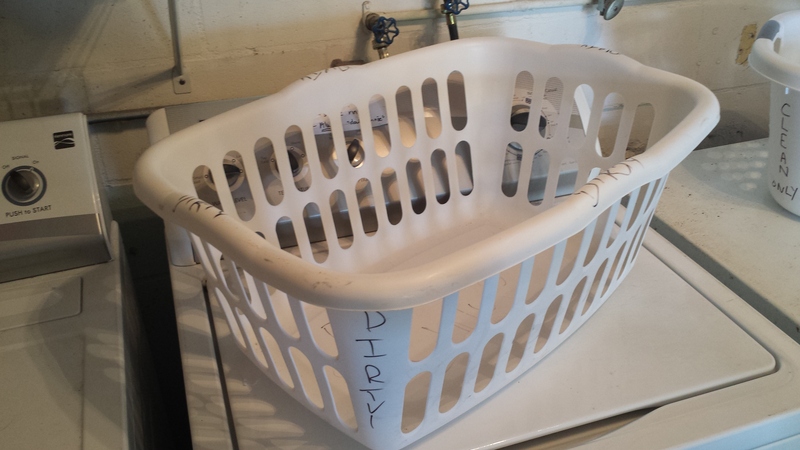 The first volley in this on-going battle happened several months ago, when I found the Dirty Laundry basket (normally kept on the floor of the garage) sitting on top of the chest freezer filled with my clean laundry Mother had helpfully removed from the dryer. In an attempt to keep this from happening again, my helpful husband got out his trusty Sharpie and labelled it. We thought that took care of the issue, until I realized Mom was using the Clean Laundry basket to carry her dirty laundry from her room to the garage. 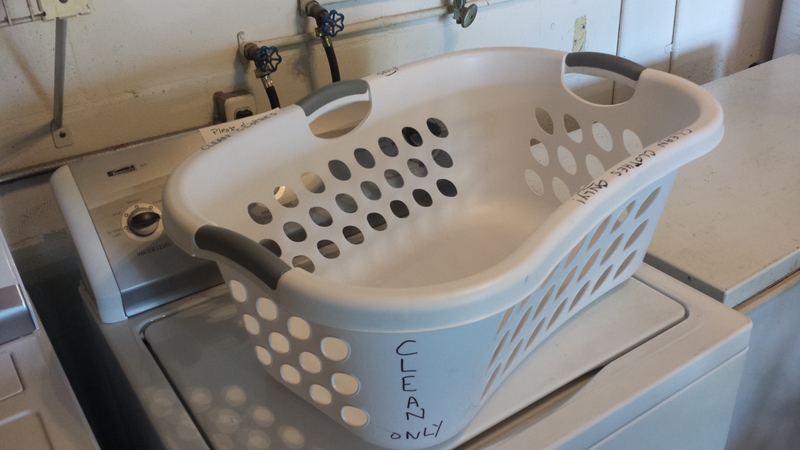 My helpful husband again pulled out his trusty Sharpie, resulting in both baskets being labelled. 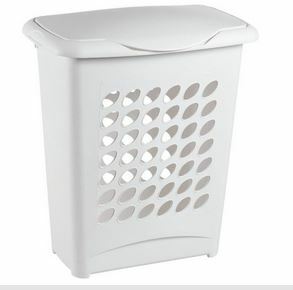 It also occurred to me that the hamper Mother had in her room might be too unwieldy (sample pic below – hamper is already gone). This afternoon, I’ll be making another trip to Target, this time to purchase a set of wall hooks for my very helpful husband to put up just above the basket in Mom’s room. All I have to do is get Mother to buy into the idea of using them instead of piling all her clothes, some of which she “might want to wear again”, on top of upside-down basket. 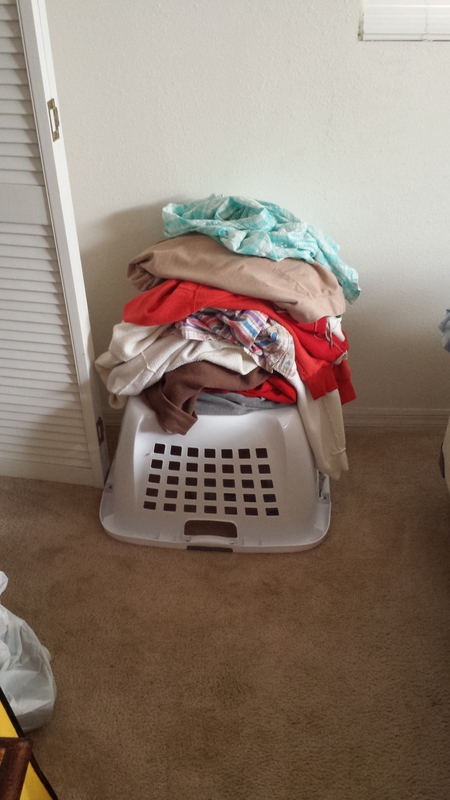 Oh, and using her own laundry basket for her dirty laundry so she’ll leave my Clean Laundry basket alone.